Nutrition labelling – how accurate are the values on my food products? In December 2016, it became mandatory in the UK for the majority of prepacked foods to display nutrition information. Most packaged foods must now display how much energy, fat, saturates, carbohydrate, sugars, protein and salt is provided by 100g or 100ml of the food. These values can be derived from chemical analysis in a laboratory, or they can be calculated from established data sources (McCance & Widdowson’s Composition of Foods in the UK) or from the actual nutrient values of the ingredients. But, two years on, how confident can food companies be in the accuracy of the nutrition information that they are displaying on their labels? You may have seen a TV presenter holding a piece of food over a Bunsen burner (note: this is not how the energy values on a nutrition label are determined!). Or you may recall media coverage on ‘Porky Lights’ sausages a couple of years ago, in which the fat content of the product was questioned. You may be concerned about the negative impact on your company’s reputation if your nutrition values are queried. 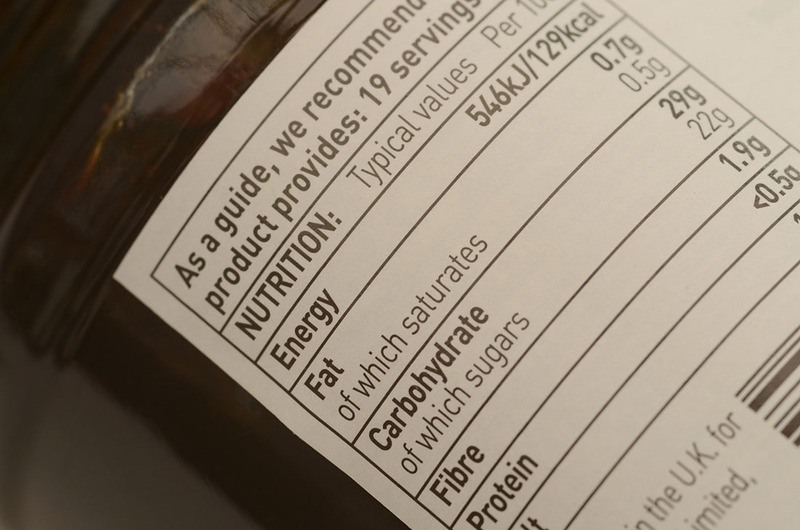 The good news is that there is guidance available to food companies on producing and displaying nutrition information on labels, together with support in place to address non-compliant labels. It is important to appreciate that the values stated on pack, whether derived from laboratory analysis or by calculation, are ‘typical’ values. Food is a natural product and its composition will therefore vary. For example, the nutrient content of plant foods is affected by season and by the composition of the soil in which they were grown, while the nutrients in animal foods are influenced by diet. In addition, nutrient content of foods can be affected by how they are stored, prepared and processed, whether in the home or by food manufacturers. And, of course, if the type or quantity of an ingredient in a product changes, perhaps due to non-availability, its nutritional value will change too. To allow for natural variation in composition of food, the EU has issued guidance on ‘tolerances’, specifying the range of acceptable variation for nutrient values declared on food labels. However, the label declaration should not mislead consumers. It is therefore vital that food companies regularly review all information on their labels, particularly when there are changes to the formulation or to ingredients, and update it if necessary, whether by commissioning new laboratory analyses or by recalculation of the values. In addition, there are many pitfalls in using food composition data (more on this in a future blog). Therefore, if using calculation methods, food companies should not automatically assume that nutritional information from suppliers is correct or that nutrient values taken from established data sources are appropriate for their ingredients. If in-house nutrition expertise is not available, it would be advisable to seek support from a qualified nutrition professional (Registered Nutritionist or Registered Dietitian) with experience in food composition and recipe analysis. This support is probably not as costly as you might expect and will give you increased confidence in the information that you are providing to consumers.